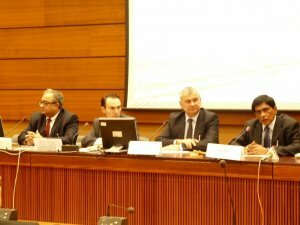 With the aim of informing the public and exploring recent and future developments for Balochistan, the Unrepresented Nations and Peoples Organization, in cooperation with the Balochistan House and the United Towns Agency for North-South Cooperation organised a conference entitled ‘Human Rights and Security Perspectives for Balochistan and Pakistan Post-2014’. 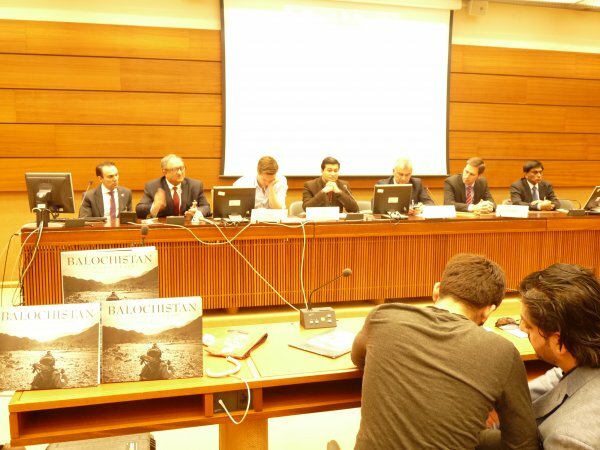 The conference took place at the United Nations in Geneva on 10 March 2014, and attracted a large audience of diplomatic delegations, journalists, academics, and human rights defenders. 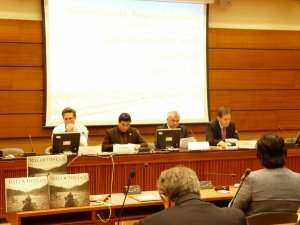 Following the opening remarks of Mehran Baluch, the Baloch representative to the UN, Johanna Green, UNPO Programme Coordinator, and Noordin Mengal, Baloch representative and human rights campaigner, the floor was given to T. Kumar, International Advocacy Director at Amnesty USA. Mr. Kumar stressed that while the troubles in Balochistan started directly after the independence of Pakistan, the situation has worsened in the last 10 to 15 years with intense human rights abuses. The biggest challenges are enforced disappearances and extrajudicial killings of lawyers, journalists and activists. Mr. Kumar further stated that in Balochistan the situation is extra dire because of two reasons: the fate of the victims remains unknown for a long time, and the perpetrators (the Frontier Corps) do not hide their identity, since there is no media interest, even not in the recent discovery of mass graves. He called for the senior leaders and the soldiers to be brought to justice. The next panellist, Mario Silva, Chair of the International Forum for Rights and Security and a former Member of the Canadian Parliament, criticised the international community for being silent while mass atrocities are taking place in Balochistan. He stressed that the UN and the global community have a moral and legal responsibility to the people of Balochistan, and a duty to investigate the ongoing human rights violations. Tarek Fatah then took the floor, also criticising the lack of attention by the media and the international community to the massive human rights abuses in Balochistan. He argued for the independence of a liberal, secular state, which is in the interest of not only the Baloch, but in the interest of everyone. The second panel focussed on the regional impact and security concerns related to the situation in Balochistan and Pakistan. Russ Hiebert, Member of the Canadian Parliament, stated that the responsible elements within the Pakistani government have to be pressured to change course. He called on nations with close ties to the Pakistani government and intelligence services to take action to end the human rights abuses, for instance by withdrawing cooperation and aid. The next panellist, Burzine Waghmar, a member of the Centre of South Asian Studies of SOAS, criticised the culture of lawlessness that runs through Pakistani officialdom. He stated that a tipping point might be on hand in 2014, despite that it has been suggested that the situation has already gone way past this point. The last panellist, Willem Marx, journalist and author of ‘Balochistan at a Crossroads’, highlighted the complexity of the situation, with the involvement of many different actors. Mr. Marx also discussed the difficulties journalists face when covering the region, stressing that it is almost impossible for non-Pakistani journalists to go there, whereas local journalists fear disappearances and extrajudicial killings. This is a threat to having reliable information, which is essential for persuading the international community to take action. The overall conclusion to be drawn from this conference is that more attention has to be given by the international community in general, and the UN in particular, to human rights violations in Balochistan, including enforced disappearances and extrajudicial killings. The international community must step up its efforts to investigate the mass atrocities currently taking place in Balochistan - especially in light of the ignorance showed towards the discovery of mass graves in January 2014. Having access to reliable information is essential, but currently made almost impossible by Pakistani military forces. UNPO believes that this conference was a positive step in giving more attention to the dire situation facing the people of Balochistan in international fora, but further action is urgently needed.